Lagniappe” is a Cajun word for “something extra,” like the extra doughnut in a baker’s dozen, the 13th ear of corn in a bag of 12, or a free cup of coffee. It’s an unexpected nice surprise. The New Orleans Convention and Visitors Bureau has put together a lagniappe for clients headed to the city, a pamphlet of tips and terms used in the Big Easy. • Bayou: It’s a Choctaw Indian word for “small stream.” It’s a creek with a slow current, flowing from a river or lowland lake, often through swamp areas. Among its many nicknames, Louisiana is called the Bayou State for its many wetland regions. • Bananas Foster: Brennan’s restaurant in the French Quarter was the first to concoct and serve this flaming ambrosia of bananas and rum, spooned over vanilla ice cream. • Cajun: Nickname for Acadians, the French-speaking people who migrated to Louisiana from Nova Scotia, starting in 1755. • Directions: There is no east, west, north or south in New Orleans. Locals head uptown, downtown, lakeside, riverside and anywhere the music is. • Cajun vs. Creole: Cajun food is the earthy, robust creation of fishermen and farmers in the bayou country of southwest Louisiana. Creole food is the cosmopolitan food of New Orleans, a mix of European, African and Caribbean cuisines. • Jambalaya: New Orleans’ answer to Spain’s paella, a Cajun rice dish full of sausage, seafood, rice and spices. • Muffuletta: A meal packed into a pizza-sized Italian bun with salami, ham and provolone lavished with olive relish. The CVB recommends going to the source: the Central Grocery on Decatur Street, an Italian import store where the sandwich was invented about a century ago to satisfy hungry Sicilian stevedores on the nearby docks. • Parish: The equivalent of a county in the other 49 states. • Po-boy: Hero. Sub. Grinder. Hoagie. Native New Orleanians eat po-boys, a staple at lunch counters across the metro area. Must be made with fresh French bread with a crunchy crust and light center. Roast beef and shrimp are the most popular fillings for a po-boy, but just about anything can be put inside a loaf of French bread and taste good. • Streetcar: This is New Orleans’ name for the world’s oldest continuously operating electric street railway, which has been around since 1893. Before that, the city had a steam engine train and a horse-and-mule-drawn line. Today, more than 20,000 people a day ride to and from work and play aboard 35 original electric cars. 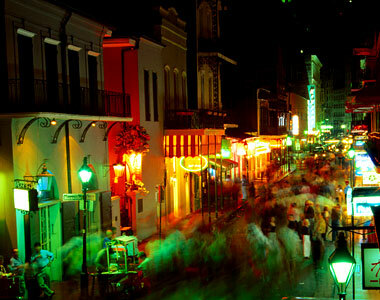 • Vieux Carre: French for “old square” or “old quarter,” it refers to the French Quarter. Its 90 city blocks contain about 2,700 European- and Creole-style buildings, housing residences, stores, cafes, restaurants and a lot of bars. Visitors can pick up the pamphlet at the CVB office in the Garden District, at 2020 St. Charles Ave. This entry was posted in Uncategorized and tagged Lingo for New Orleans, New Orleans, The Big Easy.